The children of Israel had settled in the land of Canaan. They began to worship idols that the people of Canaan served. Because of their disobedience, God allowed the Midianites to treat them badly. God sent an angel to a man named Gideon. The angel told Gideon that God had chosen him to deliver the Israelites. Gideon was not sure this was so, and asked God for signs or miracles to prove that God was really with him. Gideon started out with an army of 32,000 men. God said to tell all who were afraid to go home. 22,000 left! The next test was to have these men get a drink of water. Some of them got down on their knees and put their faces in the water. These were rejected. Some took water in their hands and lapped it out of their hands as a dog laps water. These were chosen. There were 300 of them. What a small army! God did not want them to think they had won the battle all by themselves. 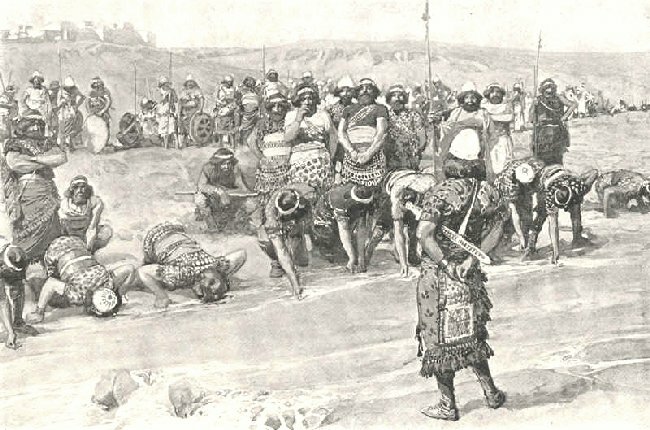 Gideon and his small army surrounded the Midianite army which was down in a valley. 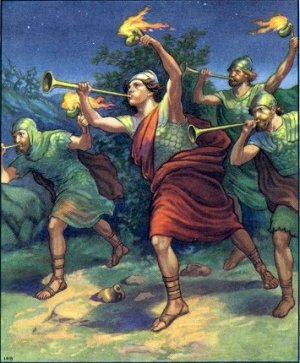 Each man had a trumpet in his right hand and a pitcher with a lighted torch in his left hand. When Gideon gave the signal, each man blew on the trumpet, broke the pitcher to let the torch shine, and shouted, "The sword of the Lord and of Gideon!" 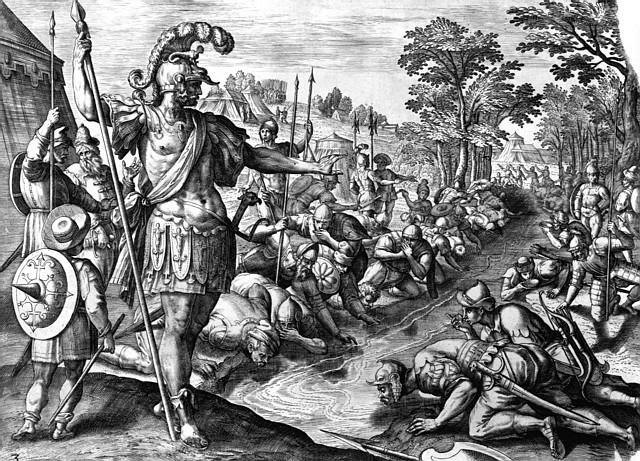 The Midianites thought they were surrounded by a huge army and became so confused that they killed one another. Gideon, with God's help, had won the battle with 300 men. Years later, the Israelites again needed to be delivered from their enemies. An angel of God appeared to the wife of a good man named Manoah and told her that she would have a son. The son was to never drink any wine, nor was he to have his hair cut. This was called the Nazarite vow. 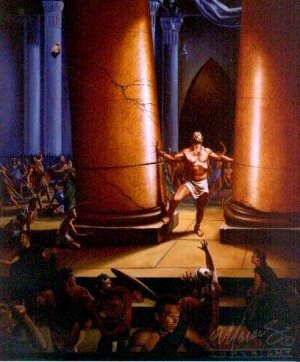 So Samson observed the vow and the Spirit of God came upon him. He was very strong. He was so strong that once he fought a battle with only the jawbone of a donkey. He killed a lion with his bare hands, and on one occasion, he carried the big heavy gates of a city to the top of a hill. But Samson loved a woman named Delilah. His enemies used Delilah to defeat him. They told her if she could find out the reason for his strength, they would give her a lot of silver. He told her three things which were not true. He first told her that he would be weak if they tied him up with new bowstrings, but he broke them. Then he said he would be weak if they tied him with new ropes. But that was not true either. Then he told her to weave his long hair in the loom where they wove fabric, but this did not make him weak. Finally, he told her the secret of his strength was because of his vow and his long hair. She made him go to sleep and the Philistines came and shaved off the seven locks of his long hair. He was so weak when he awoke, he could not defend himself. They took him prisoner, blinded him, and caused him to work like a slave. Gideon needed a sign from God in order to know if he could trust Him. Has God given us any signs of his trustworthiness? Yes, he has. We can read in the Bible about miracles that happened. People who saw them happen have written them down, and we believe their account. Jesus was made alive again after they killed him. Many people saw Him after his resurrection. We believe their story. We know we can depend on God. This story about the Judges can be found in the Bible in Judges chapters 6, 7, and chapters 13-16. English Bible Activities Select stories #63-66 in the list for activities to accompany this Bible story. Spanish Bible Activities Select stories #63-66 in the list for activities to accompany this Bible story. Press "Go" to search for books about The Judges. Thank you for this wonderful website! I use it for my weekly Religious Ed class. This page displayed 138,092 times.